In the "never thought I would see that made into a movie" category in the Best Picture competition this year are two excellent films, either of which I would be fine with winning Best Picture of the Year on Sunday. The Master, written and directed by Paul Thomas Anderson, actually cannot win Best Picture, since it was not nominated for that award, but I included it in our poll -- voting in the sidebar continues until 6 pm on Sunday, just before the Academy Award ceremony -- and it has done quite well so far. The movie officially has nothing to do with the life of the founder of Scientology. The story follows a charismatic preacher, Lancaster Dodd (not L. Ron Hubbard), with science fiction ideas about a new religion, which he established in the 1950s (when Scientology was founded) after a stint in the U.S. Navy. 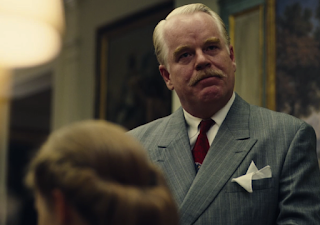 Dodd, played with monomoniacal selfishness by Philip Seymour Hoffman (fully deserving of the nomination for Best Actor in a Supporting Role), preys on the wealthy for their money and on the downtrodden for their slavish devotion to him. Closest to him are Freddie Quell, a bad-news WWII veteran with post-traumatic stress and a slew of other mental problems (the unclassifiable Joaquin Phoenix, in one of the great, disturbing, soul-baring non-performances of all time), and Dodd's wife, Peggy (sickly sweet but overprotective as played by Amy Adams). Why is The Master such an involving if critically divisive movie? It sprawls wildly, taking turns into unexpected neighborhoods -- Quell's bizarre fascination with brewing dangerous, mind-altering chemical beverages, Dodd getting his hooks into wealthy benefactress Helen Sullivan (a daft Laura Dern), the psychological torments Dodd forces Quell to relive, something awfully like the auditing technique used in Scientology. It is slow-moving and takes its time examining its assortment of generally infuriating characters, but like Dodd's odd charisma itself, it grabs hold of the viewer and we find ourselves unable to wrench ourselves away from him, much like Quell himself. While the looniness of Dodd's ideas and Seymour Hoffman's petulant self-confidence tell us something about L. Ron Hubbard and Scientology, the movie, to its credit, is not really about either one. Ang Lee, when he is not making brainless movies (Hulk), is a whip-smart director who can distill a sprawling narrative down to its essentials, in human terms. After successes adapting improbable books to film (Brokeback Mountain, Crouching Tiger Hidden Dragon, Sense and Sensibility, and the superlative Ice Storm), Lee and his screenwriter, David Magee (who wrote the excellent Finding Neverland), adapted Yann Martel's Man Booker prize-winning bestseller into a spell-binding movie (Magee would get my vote for the Academy Award for Best Adapted Screenplay). They did this with a small amount of voice-over narration, admittedly a crutch in a screenplay, by having the adult Pi Patel shown occasionally recounting his story to a journalist in between filmed episodes. 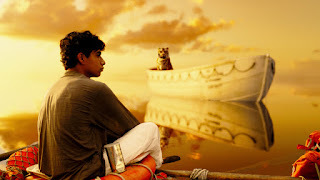 The film's strength is in the visual element of the story-telling, including seamlessly integrated CGI (the visual effects team was nominated for an Academy Award) for the animals and for the wondrous things that Pi encounters while floating for weeks on a lifeboat after the freighter carrying his family -- and the animals from the zoo they used to manage in India -- sinks on its way to Canada. The colors and settings -- in India and on the ocean -- are incredibly vivid (cinematography by Claudio Miranda, rightly nominated for an Academy Award in the category), and the beautiful score by Mychael Danna (one of Lee's preferred collaborators and the composer of the gorgeous music for Lilies, a strange but memorable film from 1996) would be my choice for Best Musical Score this year. The reviews show some critics strongly not in approval, but this film seems to be about all the things that the medium does so well, a modern sort of Gesamtkunstwerk combining visual storytelling, dialogue, art, and music. The central performance, by Suraj Sharma as Pi (with Irrfan Khan as the adult version, and Ayush Tandon and Gautam Belur as the younger versions), is unaffected and charming -- not necessarily a great acting achievement, but remarkable considering that for much of the film Sharma is interacting with a completely digital tiger. That tiger, and the other digitally rendered animals to a lesser degree, is one of the most striking cinematic achievements of the year. Interesting grouping. Both movies about bad religion, The Master overtly and LoP covertly, the latter arguing, I think, that the ability to sustain a fantasy as the substitute for an horrific reality proves the existence of God. (Really, it seems that simpleminded.) The cinematography in The Master is really quite extraordinary, although turned towards intense claustrophobia rather than the Marvels of Nature. Anderson's movie also had a compelling score. It, too, was about fantasy and horror, but no happy endings in Lancaster Dodd's world of transcendent egomania.